Get the most battery life possible out of your cigarette style Joye 510 electronic cigarette with the upgraded 280mAh Manual Baterry! The 280mAh Joye 510 battery is fitted with a manual activation button giving your control of the vapor your electronic cigarette produces! Warning: Overcharging batteries will result in damage. Please do not charge batery overnight or all day as there is a 1-4 hours maxium charging time. Once the usb charger's light turns from red to green remove the battery immediately. 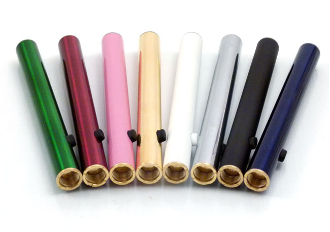 The Joye 510 mega manual batteries are available in: Black, White, Gold, Stainless Steel, Pink, Red, Green and Blue. Joye 510 mega manual battery 280mAh rechargeable high power battery.